WinCo Foods was previously known as Waremart Foods. It changed its storefront name and the corporate name in 1999. “WinCo” stands for “Winning Company,” as is stated by the website, WincoFoods.com. Eighty percent of the company is employee owned. The beginning of WinCo Foods occurs back to 1967, when Bud Williams and Ralph Ward started a discount-grocery warehouse in Boise, Idaho. They named their store Waremart, and the name stayed the same until 1999. In 1985, the president at the time, Bill Long, purchased a majority interest of WinCo from the Ward family and gave it to the employees so that they had some real stake in the company. Ever since, the company has continued to grow. The company has fostered their success, it claims, by focusing on very large stores with a wide selection of national brands, but keeping their prices below the competition’s. Employees are said to have seen their employee stock ownership plan grow at an annual compounded growth rate of 21.51%. This makes for an extremely dedicated workforce. 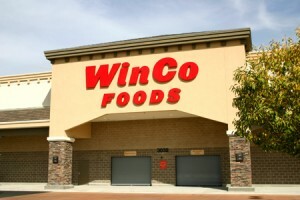 In 1998, WinCo was listed as the 266th on Forbes Magazine’s List of the 500 largest privately held companies, and in 2010 it was listed as the 65th on the list. They are considered 29th out of the 50 top grocery retailers, with a 0.6% share of the market. Annual Sales: By the end of the fiscal year 2010, the company reached $4.3 billion in total sales. Employees: WinCo currently has 13,000 employees and is continuing to grow. Responsible fuel consumption also is a focus of this company. They try to conserve fuel in the best way possible by using a transportation team to plan each trip, using the best route, and a maintenance team to ensure that each truck is kept in top shape. They also use state-of-the-art equipment to make the most out of every gallon of fuel. Aside from being green, WinCo Foods contributes to the community through its donations. For example, it donates to fundraisers for state-accredited schools nearby WinCo locations. This can be for the entire school or just a group related to the school. You can get information about how to apply for a donation by visiting their website: WinCoFoods.com. And I thought WINCO stood for Washington, Idaho, Nevada, california and Oregon – that is what one employee told me decades ago. Please consider Greenville, NC. for a location! I currently live in Az. and absolutely love your stores. I’m relocating to NC and I’m going to miss you tremendously. I’m sure they would like it as well. I would be your store ambassador for the entire state. Keep up the great work. Love your store. Best prices in town. Especially love the bulk foods section. It would be my one stop shop for groceries except that you dont carry “Caspers” hot dogs. It sure would be great if you did, and, of course extra long hot dog buns for them. I shop in the Henderson Nevada store and spend $ 350.00 a month in your store. I was in the store a week ago and buy all my meats in that store. I am and my family are steak people and cook outside a lot. I am wondering if I have a advertisement for a steak sale in another store in my area would you match there price if i showed you people the ad. It seems when we shop in the store there are not many steaks on sale. To Winco Corporate We have just learned our small Wal mart is closing. We desperately need affordable groceries here in Perry Ok. There is a grocery Homeland which is incredibly expensive. We are the County Seat. There are many of us who want affordable shopping here. But due to high prices we 9will be forced to shop out of town. Please please would you consider us. does winco carry panko bread crumbs in the bulk section? Winco Foods in Bremerton, WA has a great selection and good prices. But that’s the only reason I go there. The isle workers are the rudest people I’ve ever seen in any store ever. You almost get run over by employees working the isles. Today at 6:15 am when I went to the checkout line, I had an employee named Everett stand behind me and start pushing a stack of hand carts back and forth with his foot. Just annoying behaviors that you can’t even avoid in the early morning. I would like to know where your winco brand of Apple Juice comes from. There is a lot of Seafood I don’t buy from your Store because it comes from China and other foreign Country’s. I know you are in business to make money but you don’t have to poison people while you do it. Then shop at Wal-Mart or somewhere else. Simple as that!! Nobody asked you to buy the seafood. Or anything from that store. It’s people like you who make me laugh because you sound so ridiculous right now! Bud light has a product I wish you would carry. They come in several flavors, rassberritas, appetites, and now watermelonrittas. Yum perfect for summer drinks. Please hurry. Shopping this a.m. in Nampa, I’d…..did not find our usual Post Shredded Wheat , the original big biscuit. Thanks for taking quick action on this request!! I miss shopping at WINCO in Lancaster, CA. Please open a WINCO in Santa Rosa, CA. I would like to open a Winco franchise in Jackson, Mississippi. I have searched the web and could not find any information on how to accomplish it. Can you assist me with this issue? Just a quick note to let you know that we love your store(s). Great price and an awesome selection, unbeatable. Would also like to mention that you employee some very helpful and friendly people. We shop at store #0046 and are always made to feel at home by Aureila. She actually makes us feel like we matter, very rare these days! Thanks for an awesome store and a great shopping experience. PS. more organic foods please! I would like to ask if you could reinstate the Old El Paso Chicken and the Steak Fajitas (Meal for Two) to this store. I stopped by your store on136th in Vancouver and wanted to buy a half gallon of Darigold milk. I couldn’t find it and asked one of your employees where it went and he was surprised that he couldn’t find it. He looked in the back cooler and came back and said that he guessed that they didn’t carry it any more and that they only carried Anderson Dairy products. I hope that this isn’t true because that is the dairy that we want and I don’t want to have to start going to Walmart to buy it. Hopefully you will care enough to bring this quality product back to your stores. Bring Winco to Charlotte, NC and I will never shop at Walmart again. I like the way you treat your employees and your overall company philosphy. Even if your prices were sometimes higher I would still frequent your store. has anyone had a accident on or at a winco lately:? are you seriously injured? Please let me know if their insurance and their management were trained and helpful. If you would please share your story I will share my experience maybe we can help each other get to the bottom of all their red tape. they need to stand up and take responsibility for their employees not doing their jobs correctly. this is why there are accidents. they claim customers are lucky if they get their medical paid for. what kind of racket is this? HAS ANYONE HAD A ACCIDENT AT A WINCO LATLEY? Have you slipped or fallen? no joke….. no ins pranks. Please contact me about your case and how the store handled it. Are you satisfied with the outcome. Do you feel you were t treated fairly? Please share your misfortune and maybe we can help each other..Thanks for your time and looking forward to hearing from you. Why don’t you carrie everthin in the universe! Just joking. Shopping at Winco can be a little annoying on weekends, but during the week it is a breeze. I do wish they carried Wild Roots Coastal Berry trail mix. But then again if you had a store that stocked every little thing everyone wanted it would be so big nobody would want to go there and if you manned every register 24-7 you could not afford to shop there. If I need to go to another store for a few items and that is my biggest beef in life I am living a better life than I deserve. Winco’s produce department is what I would call suspect. I have to be very careful in picking out our produce. In the meat and dairy department I have to check date codes because their rotation is terrible. The last straw was ten days ago when I tried to return a pack of AAA batteries. We spend $200 a week at our Perris Cal. Winco and they wouldn’t give credit. Stupid! Back to Stater Bros. I go. I live in Longview WA. I have been comlaining about this for over 3 years now- Handi cap powered carts- The store in longview wa does not have enough of them. Today I go there to shop with my mother, I waited one hour and still no cart. My mother finished her shopping but I did not even get a chance to do my shopping so we left. I complained once again to the manager once again it did no good. You stores need more than 6 handicap carts which I was told is all handled by and at the coroorate level. I am up in arms over this. You need more handi cap parking and more carts. I am sick and tired setting there on a cart that does not work, is un charged, and wind up wasting my time to do what, just wait for nothing because all this time wasted and i still wound up with no cart. so do I stop shopping at winco or do i teel a news taem about at say king 5 or KOIN 12 news any way to mget reconiotion to this problem! My wife and I purchased 3 packages of Winco Winter Blend broccoli and cauliflower. The packages consisted of about 90% cauliflower and the rest scarps of broccoli. The broccoli was mostly small pieces of stem. After cooking the broccoli stems were so tough they were inedible. We have been weekly customers of Winco since their inception as Waremart and have never had a single complaint about anything to do with your company, but this is a first. We felt that you should be made aware. With the debate and upcoming vote on putting GMO ingredients on food labels, I would like to see Winco Foods publicly take a stand and insist that their suppliers have labels that indicate if the product contains genetically engineered ingredients so your customers can make informed choices while shopping. I do not care if people create, or use genetically modified ingredients, I just want to be able to know if that is what I am buying. I just wanted you to know we will no longer be shopping at Winco due to poor management. It is sad that good people hours are being cut while lazy asses who make less are being kept. GOOD BYE, many other super markets respect good employees and realize that they are the ones that keep customers coming back. If you think your bottom line will look better with poorer help then you deserve what you get. This is in reference to the store on sprague in the Spokane Valley. I would wish you luck but I believe only good service works. better. I left a bag of the winco tater puffs out by accident, and they completely thawed, my question is can they be re-frozen and safe to eat? you carry the vanilla but not the above. would be great if these two items would be carried in your store as these are staples on our shopping list. I’am requesting a new order for store 0046 please order Alaga syrup cane flavor product of Whitfield foods. 1-334-263-2541, located in Montgomery,Alabama 36101. I have to travel 72 miles to purchase this product. It is very hard find sharp Colby long horn cheese in Moreno Valley,Ca. I always shop in this store it will be nice to purchase everything in one store which is down the street were I live. Thank you. hope to see these two in the store soon . My friends and family just love the Tequila chicken wings/legs; which I believe are a product from Tyson. Recently we have not been able to find the product in your store in Spokane, WA. This was the only store we could find our favorite appetizer. We would all love it if you would bring it back to our local market! Tigard community would like some help in fighting Walmart from opening a superstore in our neighborhood – right across the street from your Tigard store. We fought it once and was successful. Then Target was going to build in that space. We think this was a BIG scam. Now they are back. The city has issued the permit. Can you help us???? I shop at the Bakersfield store weekly. If you track sales, you can check it out. I have been disheartened last 2 visits. I found Tru Moo Choc milk in 1/2 and gallons replaced by Horchetta(which I will never buy). I have found overripe bananas, No Sweat Baby Rays regular BBQ sauce. And last week, no eggs unless you want 5 dozen. Are you having issues with your computerized reordering system or is it you just don’t care? There are three other grocery stores and a Wal Mart within 2 miles. Just because some of your prices are low doesn’t guarantee you a customer. BTW, I shop at Vons for Code Red because the Pepsi flunky won’t leave any at your store. Just to let you know, Frito Lay is doing a good job marketing product. One major physical issue with the store is that the sewer vents at the front of the store making for an occasional wonderful stink. Since “everything speaks.” the stink is a powerful welcome mat that sets off the visit in a less than desirable way. LOL This is NOT the WINCO website. If you go to the actual WINCO website they have ads, store locations, coupons, hours, location, etc all available. I am a loyal Winco shopper from CA. Just recently had to relocate to the Charlotte, NC area. This is a beautiful area and is one of the top 10 relocation destinations in the country. However, it has one major fault – grocery options are limited, and prices are incredibly high. There are 3 primary grocery store chains in this area (Harris Teeter, Food Lion & Walmart), and food costs are outrageously high. Other independents like Whole Foods and Trader Joes have recently come to the area – however, their prices are also at the upper end. The demographics are great for a Winco, and there are several locations currently available to accommodate the square footage typical of a Winco store. What would it take for me to encourage Winco to look into expanding into the Charlotte, NC area? I am a working professional, however, I am willing to spend whatever amount of time is required to support the research needed for Winco to serioiusly consider expansion to this area. That is one way we keep our prices lower . Why spend millions a year on print ads? Ummmm no, they are employee owned. then why do walmart employees shop at WINCO???? Good question – are they nuts??? But Winco DOES have sugarless things, you need to look harder.